1952 Reddi-Wip Whipped Cream Ad - Strawberries Sing! 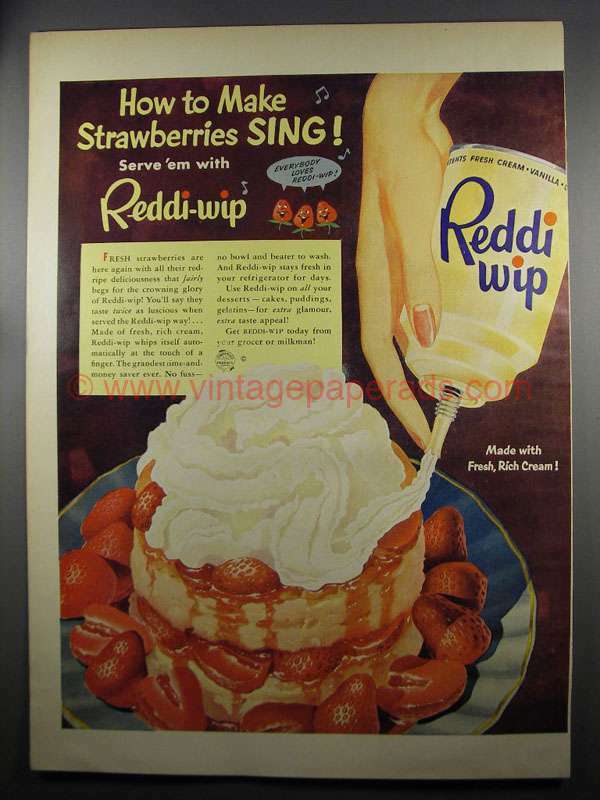 Vintage Paper Ads > Food - Restaurant > Dairy > Other Dairy > 1952 Reddi-Wip Whipped Cream Ad - Strawberries Sing! This is a 1952 ad for a Reddi-wip Whipped Cream! The size of the ad is approximately 10.5x14inches. The caption for this ad is 'How to make Strawberries sing! Serve 'em with Reddi-wip' The ad is in good overall condition, with some light wear. This vintage ad would look great framed and displayed! Add it to your collection today!